You might ask what latter in the sentence means. What did Anna really choose? Former and latter are two words that some people find confusing. Others don’t even know what they mean. Let us take a look at these two terms and see if they have any differences. Former refers to the first of two people or things that were previously mentioned. Former comes from the Middle English word forme, which means first. It can act as an adjective or a noun in different forms. Latter means the last or second of the two things or people previously stated. The word is derived from the Old English word lætra, which means late or slower. Just like former,latter also functions as an adjective and noun in different forms. 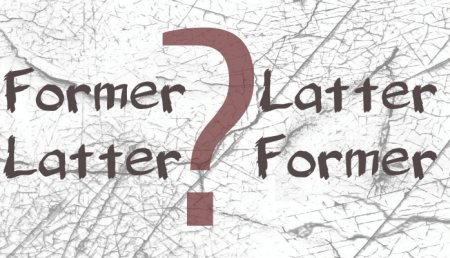 What is the difference between former and latter? Former and latter often appear as a pair, which is confusing for many people to identify if they are similar words or not. The fact is that the two terms are the opposite of each other. Former means the first of two, while latter is the last or second of two. Both words work as a noun and an adjective. But they’re also determiners, meaning words that determine the kind of reference a noun already has. A simple and straightforward tip to easily identify the two terms is to remember the first letter of each word. Former means first, and both start with the letter F. Latter means later, and both words also start with the letter L.
In her former years, Grandma was a beauty. The latter part of the novel had me sitting up all night! Between Johnson and McGregor, the former is more loved by the citizens. In the end, she chose the blue one over the purple dress. The latter looked dull.